I'm an unapologetic chip lover. I'm not saying to eat chips for every meal of the day, but if you think chips will ruin your life or your diet, you have other issues going on. One variety of chips I haven't had since going Vegan are sour cream & onion. I always liked them, but I thought a Vegan version would be close to impossible. 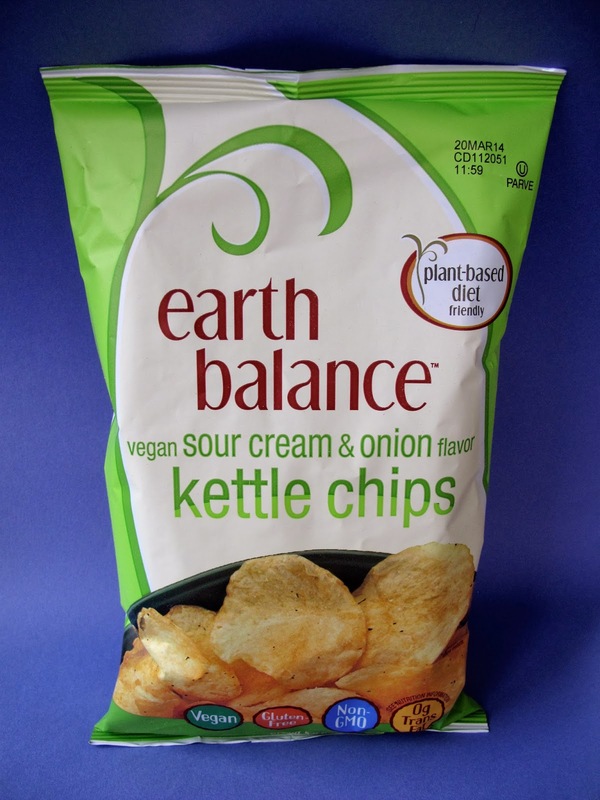 Well, I'm happy to report that Earth Balance has made an excellent Sour Cream & Onion Kettle Chip that might even fool non-Vegans! The Kettle chip is a harder chip, which I can either take or leave. The flavor on the other hand is 100% zesty tang. They actually used Vegan sour cream which is awesome! It tastes like the real thing to me. I'm also happy to report that they are Gluten-free, Non-GMO and Kosher. So score another one for the Vegans, we finally have a sour cream & onion chip! So what's next? Yeah!! I'm going to have to keep an eye out for those. I've been addicted to their aged white "cheddar" puffs. They're so damn addictive that I can't buy them that often. Sour cream and onion chips!!!! These were my vary favorite chips, and I'm a chip lover. Can't wait for these to be sold in Montreal... we're still waiting for the aged-cheddar puffs though, so it might take a while. this is a major win, i need these! I just tried their cheddar kettle chips. Amazeballs! !